Seeing as Furious Fists gave us a good Eevee which makes the Stage 1s a lot easier to get into play, it’s well worth having a look at any new Eeveelutions to see if they can take advantage of it. Blizzard is a nice enough attack for the low cost of a single Water Energy. 30 damage plus 10 spread to your opponent’s Bench is super good value. To really work, though, Glaceon needed a better second attack than Ice Edge. 60 for three Energy, with a coin flip for 30 more is kind of underwhelming and means that you are relying on a flip to OHKO a Water-Weak EX (by which I mean Landorus). If you’re building an Eeveelutions deck and looking to exploit key Weaknesses, then I think Vaporeon PLF is a better bet to fill the Water attacker role, as Gold Breaker is only a Muscle Band away from a two-Energy OHKO. Hey guys, welcome back to another Card of the Day! 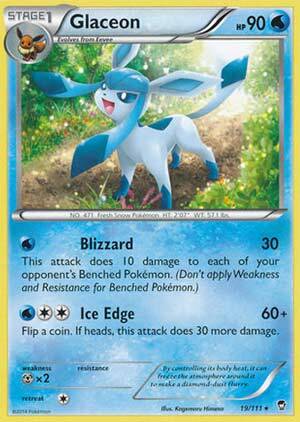 Today we get to take a look at another Eeveelution to use with this set's Eevee, Glaceon! Will it be powerful enough to run in such a deck? Could it bring it up to competitive heights? Let's take a look! Obviously to use Glaceon, you need to be running some form of Water Energy, whether that's the Basic Energy itself, the XY Rainbow Energy, or if you're in Expanded the Blend Energy that runs Water on it. This is just a general rule with any Eeveelution deck, and the real trick is balancing the Energies you use with which Eeveelutions you use. Really this all goes without saying, but it's an important note to consider all the same. So what does Glaceon do? Well for 1 Water Energy, she sends out a mighty Blizzard, dealing 30 damage to the Active Pokemon and 10 spread damage to the Bench. I'm not sure how often Mr. Mime (PLF) is used anymore these days, considering that most of the time decks are focused now more on attacking the Active Pokemon, but in any case, this allows for some decent set-up. It's not as spectacular as, say, ye olde Kyurem's (LTR) Glaciate, which does 3 times the spread damage for 3 times the cost. Course, it's also dealing 30 damage to the Active Pokemon like Glaceon, but the extra 20 per Bench-sitter is really handy. Ice Edge isn't that spectacular, but it's a decent move. It hits 3-for-60 damage and adds a coin flip to deal an extra 30 - hitting that magical 90 that's common amongst the evolutions these days. Of course, you're still hitting for 60 half the time, so on average, you're dealing 150 damage unboosted with this attack, which if you've coupled a Blizzard on that is 180 damage plus any remaining spread damage from previous rounds. Ideal as that may seem, that's still 3 turns minimum to deal enough damage to K-O an E-X, and that's N-O good. Boosting this with Muscle Band and HTL is necessary, and as is generally the case with many of these guys, it's not gonna be worth it to run it on Glaceon over a different attacker. Glaceon does do nice things, but she just doesn't do them as well as others. Could she be useful in an Eevee-based deck? Potentially. Could she enter it into the competitive realm? Not currently. It's probably safe to say that the Glaceon from Plasma Freeze is better than this one, and it's meant to be Team Plasma support anyway. If you're looking for a Glaceon to add, go for PLF, but if you just wanna collect em all, this one's a must for the collection. Arora Notealus: Apparently Glaceon can freeze the air around them into a flurry of ice crystals. Sounds pretty neat, could have a Christmas in July after all! Next Time: Hitmonchan's rival approaches! Our second candidate this week has no connection to the first save being from the same set: Glaceon (XY: Furious Fists 19/111). It does have connections to Eevee (XY: Furious Fists 80/111) - reviewed already here - and Sylveon (XY: Furious Fists 72/111) - reviewed here; I won’t be going into those cards (or other Eeveelutions) since they were already addressed (yes, the Eevee review covers all Standard and Expanded legal Eeveelutions in brief). Also be aware that these reviews aren’t going to really factor in XY: Phantom Forces; I don’t have enough data to do anything but speculate and even I don’t trust my past speculations enough to try and anticipate where the game will be once that set is legal for Organized Play tournaments. Glaceon is a Water-Type Pokémon, and that’s useful for hitting some Fighting-Types and most Fire-Types for Weakness; right now this is mostly a boon for smacking Landorus-EX and Pyroar (XY: Flashfire 20/106) for double damage, maybe some splashed in Fire-Type attackers meant to punish the likes of Genesect-EX and Virizion-EX. Water-Types have some support, but most of it seems to be Evolution based and Evolutions aren’t doing the greatest right now. The future might be promising, however; while no new Type support is coming, XY: Phantom Forces contains Metal-Type support; much like the popularity of VirGen decks, something strong and Fire Weak will likely encourage the play of more (almost always Water Weak) Fire-Types. Being a Stage 1 is a drawback but it isn’t impossible to overcome and in this case the previously mentioned Eevee can speed things up so that you’re not out a turn to Evolve (though its still two cards for one Pokémon). The 90 HP is small; not the worst we’ve seen on Stage 1 Pokémon, but it means only a deck that isn’t fully set-up or that isn’t trying to win via a straight up assault is going to fail at the OHKO. The Metal Weakness is another area where I’ll take a stab at predicting future trends, but mostly because I’m actually relying on old ones. Right now Metal Weakness is one of the safer ones (relatively speaking) but XY: Phantom Forces means new support for Metal-Types and people like to play with those new toys even if they don’t prove worthwhile in the long run (and some look to have real potential). The lack of Resistance is disappointing but unlikely to be critical, and the single Energy Retreat Cost is very good. Glaceon has two attacks; for [W] Blizzard does 30 points of damage to the opponent’s Active Pokémon and 10 to each Benched Pokémon. I really liked this attack when I first saw it, hoping to use it for inexpensive spread shenanigans, but doing damage to Benched Pokémon is easily thwarted by both Mr. Mime (BW: Plasma Freeze 47/116) and the Stadium Mountain Ring. Of course you can counter those counters, and even with them existing, for just [W] that is an excellent attack. For [WCC] the second attack - Ice Edge - does 60 damage with an additional 30 on a successful coin toss. Simply put, you should be getting at least the 90 before the coin flip, plus something I have been a bit slow to realize and remiss for not stressing sooner, three Energy on a probable OHKO Stage 1 (even one that is a bit easier to get into play) is itself a bit riskier, so to be competitive in the current environment, you’ve got to do something really special. Still, Ice Edge has its uses, mostly against Water Weak Pokémon when its worth “overpaying” for the OHKO. So does Glaceon have a use? Yes and no; it is the only source of spread for Eeveelutions but because there is only so much room for Eeveelutions, you can’t afford to run all of them. There are even two other options for Glaceon: BW: Dark Explorers 30/108 (and its reprint BW Promos BW90) and BW: Plasma Freeze 23/116). They have the same Attributes as today’s card, save for a Retreat Cost of two on BW: Plasma Freeze 23/116 (that version’s Ability will cause to function as a free Retreat Cost). BW: Plasma Freeze 23/116 and its Ability are great if you’re running enough Team Plasma Pokémon (Team Plasma Pokémon pay [CC] less to retreat), though with its attack only doing 60 plus Sleep for [WCC] it isn’t really worth it as a “pivot” Pokémon in a deck with few or no other Team Plasma Pokémon. Otherwise BW: Dark Explorers 30/108 and BW Promos BW90 might have slight value as an inexpensive attacker, as for [C] it does a 10 (+30 on a successful coin toss) or a reliable 40 for [WC] while moving an Energy from itself to something on your Bench. If it hit just a bit harder with either attack so that you didn’t have to layer on a Silver Bangle, Hypnotoxic Laser and Virbank City Gym in play to OHKO 170 HP Water Weak Pokémon-EX, it actually might have worked as a situation specific glass cannon. So while the other two Glaceon aren’t overly likely to crowd it out, what about the other Eeveelutions? That was why the answer was “yes and no” for Glaceon usage; the niche spot for “Water Weakness exploitation” is occupied by Vaporeon (BW: Plasma Freeze 20/116); unless a deck runs no other Team Plasma support this is clearly the best Water-Type attacker as it can power-up in a single turn (via a manual Energy attachment and Colress Machine/Plasma Energy) and can use Deoxys EX or Muscle Band or Silver Bangle to buff its Gold Breaker into OHKO territory against Water Weak Pokémon-EX. It still delivers a solid shot to most other Pokémon-EX (Virizion-EX is annoying with its Water Resistance) but must rely on such boosting against non-Pokémon-EX: not ideal, but much more useful than what Glaceon offers. As stated, I tried going the spread damage route while skipping most of the other Eeveelutions but either you’re at the mercy of Mr. Mime or you’re building a deck more suited for Gourgeist (XY 57/146). Dusknoir (BW: Boundaries Crossed 63/149; BW: Plasma Blast 104/101) is pretty happy with Glaceon but Seismitoad-EX is making it painful to play Stage 2 Pokémon… and without the ability to re-arrange that damage it likely won’t accrue fast enough to take the needed KOs. Standard: 2/5 - Perhaps a bit generous but Glaceon is a really solid spread attacker; if it placed damage counters for hits to the Bench and Seismitoad-EX wasn’t making Evolving so difficult, Glaceon might have proven competitive. Expanded: 2.25/5 - The addition of Level Ball is not to be ignored, plus a few of the worthwhile, returned Pokémon are lower HP Bench-sitters, though such decks will almost certainly have Mr. Mime or Mountain Ring to deal with Bench damage. Limited: 4.9/5 - Only skip this if you are certain you can build a mono-Basic Pokémon (“+39”) deck… and even then make sure its one of the better choices for such a task. Everything else, make space for Eevee and some Water Energy. Summary: Glaceon is a card that is both a disappointing and inspiring; close to being an appropriately powerful card worth competitive play, it misses out in part due to counters meant to handle far more abusive cards and the raw power of several other more abusive cards… and that only happens because the design team seemed to preemptively “nerf” Glaceon, giving it a great lower Stage, a lot of combo potential, a good spread attack… but an overpriced follow-up second attack that lacks any synergy beyond “it hits harder than the other attack”.